The paper, “Tailored organic electrode material compatible with sulfide electrolyte for stable all-solid- state sodium batteries,” is authored by Yan Yao, associate professor of electrical and computer engineering. The primary authors of the paper are two postdoctoral researchers in Yao’s group, Xiaowei Chi and Yanliang Liang. “It’s gratifying that our paper was selected by the editor to highlight,” Yao said. “In this work we demonstrated an all-solid-state sodium battery using organic electrode materials for the first time.” It appeared in Angewandte Chemie’s issue 10 on March 1. The project was inspired by exploding hoverboards — technically more of a self-balancing two-wheeled scooter — from a few years ago. Hoverboards are powered by conventional lithium-ion batteries, which use flammable liquid electrolyte that can overheat, causing the boards to burst into flames. Yao was contacted by Houston’s KHOU 11 News for an interview on this topic in 2015. The UH Yao Group: Dr. Yan Yao holds the solid-state sodium battery, with Dr. Yanliang Liang next to him and Dr. Xiaowei Chi behind them. 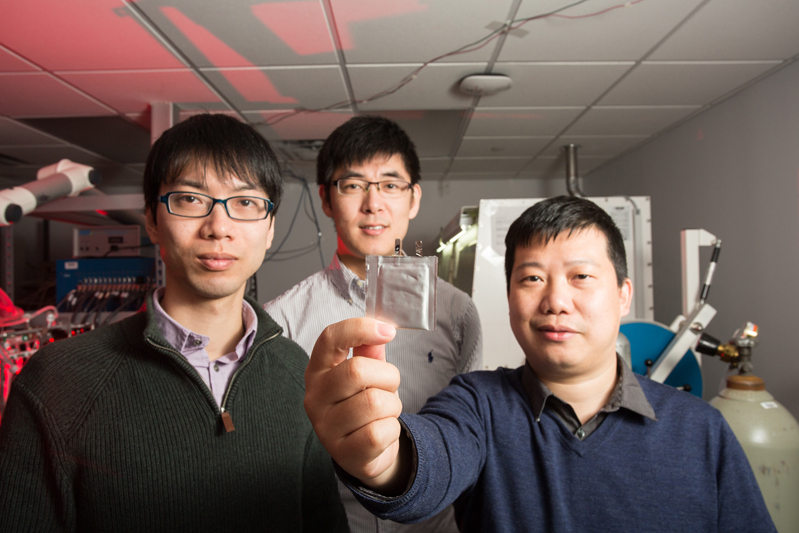 Yao and his team have embraced the challenge of creating better, safer and cheaper batteries. The team specializes in the creation of next-generation batteries that use abundant, low-cost organic materials. In the cathode, the team used quinones — which can be synthesized from plants and food like maize or soybean — to increase energy density, chemical stability and overall safety. For the anode, they’re using sodium, a material that’s more readily available in the Earth’s crust than lithium. The team is first to make solid-state sodium batteries with a demonstrated record of recharging stability. While most solid-state sodium batteries diminish rapidly after 15 charging cycles, this new battery has gone for about 400 cycles, Yao said. These solid-state batteries could benefit a range of industries including renewable energy, transportation and personal electronics. However, Yao expects the new batteries will initially be used in high-end products like luxury electric vehicles — something that could happen in three to five years. The project was funded by the Advanced Research Projects Agency-Energy OPEN 2015 and the Department of Energy’s Battery500 Consortium. Other Cullen College students who contributed to the battery development are F. Hao, Y. Zhang, H. Dong and P. Hu. The team also includes collaborators from the University of Colorado Boulder. Last year, Yao’s group published a technical breakthrough on aqueous batteries in Nature Materials using inexpensive quinone materials. To further explore the fundamental mechanism in aqueous batteries, Yao teamed up with Jahan Dawlaty of the University of Southern California, and Puja Goyal of SUNY Binghamton. The team recently received a Scialog Award from Research Corporation for Science Advancement (RCSA) to understand how protons behave within the crystalline lattice of organic crystals.